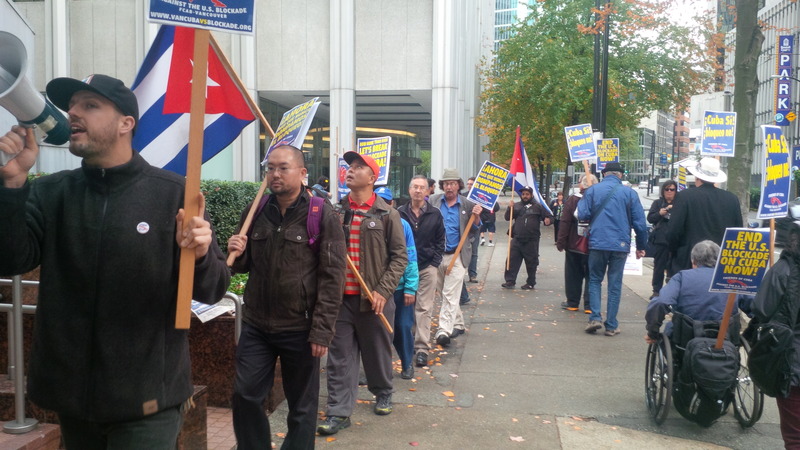 Lift the Blockade on Cuba NOW: Vancouver joins the international call for the 2nd month in a row! At the end of October, 2015 the United Nations General Assembly (UNGA) will once again vote on the resolution against the U.S. blockade on Cuba. In fact, in October 2014, for the 23rd time, the UNGA voted to condemn the US blockade on Cuba with 188 countries voting against the blockade and only two in favour (the US and Israel). The picket brought out supporters of Cuba from many different walks of life, students, workers, and retired people. 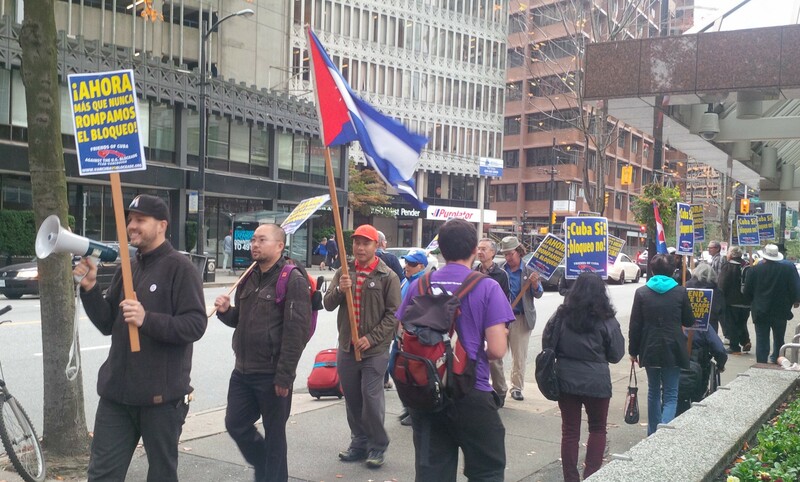 This included rally speakers, David Whittlesey, a long-time civil rights and social justice activist, Tamara Hansen, the coordinator of Vancouver Communities in Solidarity with Cuba (VCSC), and Shakeel Lochan, a social justice organizer and poet. David spoke especially about the insanity of the blockade, which for over 54 years has been a key part of the U.S. strategy to overthrow the Cuban government. This failed strategy has cost the Cuban government more than 1 trillion dollars, denying Cubans access to basic medicines and educational supplies. On December 17, 2014, the government of the US and Cuba announced renewed diplomatic relations. Despite this, the U.S. blockade remains in full force. 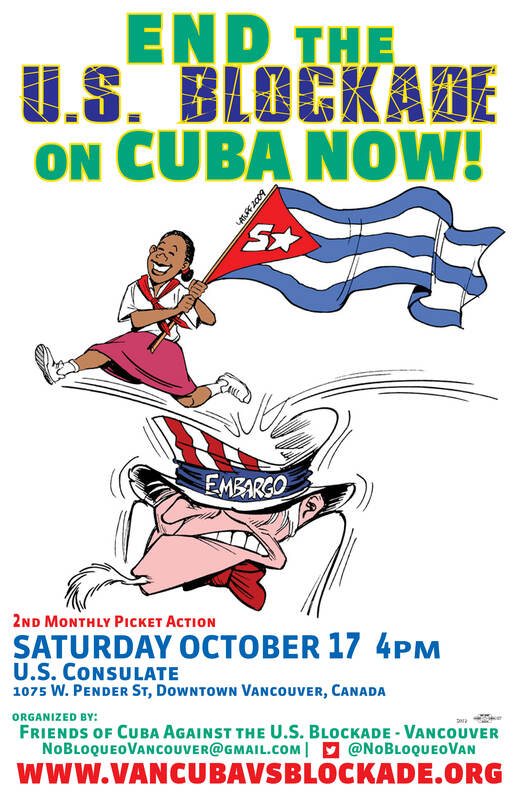 Friends of Cuba Against the U.S. Blockade – Vancouver is committed to organizing monthly picket actions in opposition to the criminal U.S. blockade against Cuba, on the 17th of each month until the U.S. blockade is lifted once and for all! END THE BLOCKADE ON CUBA NOW! US GOVERNMENT STOP THE CAMPAIGN OF ‘REGIME CHANGE’ IN CUBA AND IMMEDIATELY STOP INTERFERING IN CUBA’S SOVEREIGNTY AND SELF-DETERMINATION!